Hello Aspirants, looking for NDA 1 & 2 2018: Application Form, Exam Dates, Eligibility, Syllabus and Clear Exam .Indian army recruitment we have a good news for you as Indian army soon will be announcing Applications for Candidates can apply for NDA 1 2018 at National Defence Academy (NDA), Pune for commission in the Indian Army in all Arms/Services. Interested and Eligible candidates can apply online by reading article from the official website of Indian army on or before 10h FEB 2018. Feel free to ask below in comments regarding SSC Tech Women Entry. For Army Wing: candidates must have passed 10+2 or equivalent exam organized by the State Education Board or a University. For Air Force and Naval of NDA and 10+2 Cadet Entry Scheme at Indian Naval Academy: students should have cleared the 12th or equivalent exam with Physics and Mathematics subjects. The candidates will be given a stipend of Rs. 21,000/- p.m. (Rs 15,600/- as pay in Pay Band plus Grade Pay of Rs. 5,400/-). On completion of training they will be commissioned in the rank of Lt and entitled to pay as admissible to the rank. Army also provides free Medical Facilities for self & dependents, Canteen facilities, Entitled Ration, Mess/Club/Sports Facilities, Furnished Govt. Accommodation, Car/Housing Loan at subsidized rate. For details of pay and allowances and facilities visit website www.joinindianarmy.nic.in. Type of Question: There will be objective type questions asked in the examination. Exam Mode: The exam will be conducted through pen and paper based mode. Exam Duration: Two and half hour duration will be given for Code 1 and Code 2. Section: The exam will consist of two sections like Mathematics and General Ability Test. Language: The question paper will be asked in bilingual, i.e. English & Hindi only. Negative Marking: There will be negative marking done for wrong answers. 1. Aspirants should know all the subjects and the lessons which will be asked for your NDA exams. NDA exams focuses on mainly various subjects English, General Knowledge & Mathematics. Candidates should be well known with all the lessons which will be questioned in the exams. 2. For your English Paper candidates should start reading English newspaper which will do 80℅ work for you in clearing your English paper easily and helping you to score maximum marks. Rest 20% candidates have to go through the Synonyms ( meanings) and Antonyms ( opposites) of words which are essential for you to score marks in English Section. Rest all things are covered from reading newspaper, watching English movies, News channel etc. 3. Now in General knowledge section this will cover a huge section candidates generally try to clear the sectional cutoff in this section as it covers a vast portion. In this you have to read books of class 8th to 10th of subjects History, Geography, Science, Politics, Economics and Current affairs from web or from our site. This section needs knowledge about your basics. So have to pay keen attention to this section. 4. Moving ahead is your Mathematics section. This section covers maths question up to your 12th class. Candidates have to learn all the basic formula which will help them to solve the questions quickly and correctly. 'Practice makes man perfect' as it is said this will help you in this section. 5. Aspirants are requested that they should also go through the previous year question papers so that they will be aware of the paper and the type of questions which are asked in NDA exams. Candidates can also download the previous year question papers to clear NDA exams. 6. Most valuable thing which will help you to clear NDA exams is your books, e-books, notes, guides, etc from which you prepare yourself. Candidates should according to the subjects should prefer for books and should work on each section in NDA exams. If you need help or not aware of the books which one to be used you can also buy books and practice question papers sets online which will surely help you to clear NDA exams. 7. At the end we always get many questions regarding current affairs which consist of 30% of general knowledge paper. Candidates are confused as they don't know what they should study and till where. So we would like to tell you just focus on the news which is 6 months back. 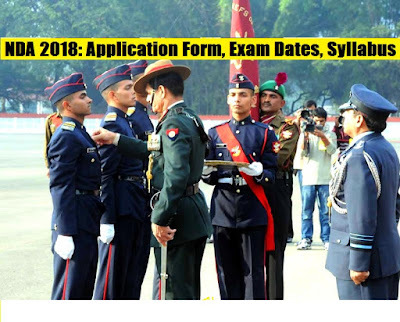 NDS exam paper consists of current affairs generally of armed forces news, newly launched missiles, army, navy, air force exercises, newly appointed ministers, new laws or bill passed or any recent big news, themes of that day etc. Is is is safe to give out bank account number.Doing this much will help you to easily answer maximum questions. 8. Start your studies right now this is the correct time. Don't think like your academics paper which you can clear in one night. Seriously this will take hard efforts to clear exams. And your aim should not be only to clear cutoff but also to clear NDA exams cutoff with good marks so that you don't have any problem in your merit list. So aspirants this is the golden chance you have got to live your dreams. Get up and make that happen. 9. Lastly, after all this tips the most important CONFIDENT which you should be while solving the NDA paper. Many of times it happens that you have studied for the question you are solving but you are not ready to answer it or you are afraid if you answer and it is wrong which will affect your result. So you have to be confident while solving paper and this will happen if you follow all the above 9 golden tips which will make you confident to clear NDA exams. Look for NDA 2018 and Click on it. NDA Registration 2018 will be done in two parts. In the registration part-II, students have to select the exam centres and make the fee payment through online or offline mode. Upload the scanned images of photograph and signature. Accept the declaration and take printout of the filled application form for further use. There is no need to send the printout of the application form to the authority. The authority shall release the NDA 2018 Admit Card via online mode. Students can get their admit card via online mode through the website. To download the admit card, candidates have to fill up details like RID, Date of Birth or Roll Number & other details. Candidates note down the NDA hall ticket will not be sent by post. The admit card bear exam related details like students name, roll number, exam centre, exam date & timing, etc. Without admit card, candidates will not be permitted to appear in the examination. The result of NDA written examination will be released after one month from the exam. The NDA 2018 result will be declared via online mode through the website. The result of shortlisted candidates for SSB Interview will be displayed in PDF format. Shortlisted candidates are needed to appear for the SSB Interview round organized by the Services Selection Board (SSB) of the Ministry of Defence. After clearing the SSB interview & other rounds, the final result will be declared. After qualifying the written examination, candidates have to appear for the SSB Interview round. Candidates have to appear for the SSB Interview on the date & time given in the call letter. The SSB interview round will be conducted in two stages over five days. Stage 1 will comprise of OIR (Officer Intelligence Rating) and PP & DT (Picture Perception & Description Test). Stage 2 will have Group Testing Officer Tasks (GTO Tasks), Psychology Tests, Interview & Conference. Candidates have to bring their original 10+2 or equivalent exam certificates to the Service Selection Board. Documents will be verified after clearing the SSB Interview round. Original documents will be returned to candidates after document verification process. After clearing the SSB round, shortlisted candidates have to go through the medical test. The medical test will be organized over three to five days.